At the turning of an hourglass in an angel’s hand, a rooster crows three times and eerie bell music rings through the Cathédrale Saint-Jean in Lyon. The mechanical spectacle comes from an astronomical clock that has been keeping the time and the path of the stars since the 14th century. 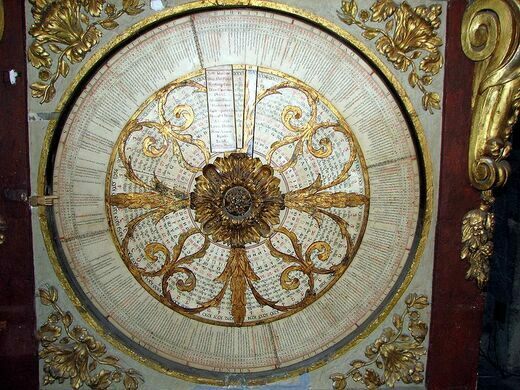 The clock is one of the oldest in Europe and has an astrolabe that indicates the date, the position of the moon, the sun, and the earth, as well as the stars in the sky over Lyon. Created in the age of geocentrism, the sun is shown circling the earth. 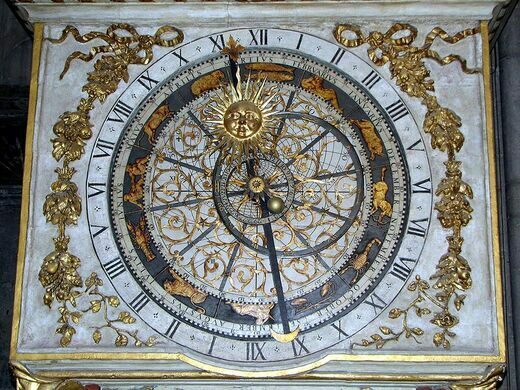 An astronomical clock was first documented in the cathedral in 1383. 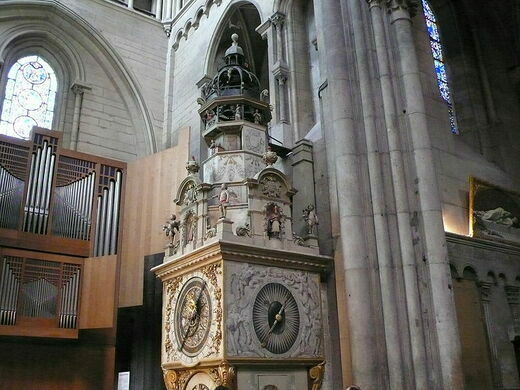 It was almost completely destroyed during a 1562 raid by the Baron of Adrets during the War of Religions, and in 1661 was reconstructed by master Lyonnais clockmaker Guillaume Nourrisson. During the French Revolution, all ornamentation that referenced royalty, like coats of arms and fleur-de-lys, was stripped from the clock. The last restoration was in 1954, when the clock’s perpetual calendar of 66 years was reset. It will be accurate until 2019. The 9 meter tall clock has a central tower topped with an octagon supporting several automatons. After the angel on the left turns the hourglass, an angel on the right keeps the time for the three angels who play the hymn of Saint Jean-Baptiste on tinny bells. The Virgin Mary is shown kneeling in a chapel, and turns to the Angel Gabriel as he opens the chapel door, while the Holy Spirit in the form of a dove descends. A Swiss Guard rapidly goes around the dome of the clock tower, saluting with his hand. All of the automatons freeze at the sounding of the hour. In a western niche, there is a statue that rotates at midnight. On Sunday, it becomes Jesus resurrected; Monday: his death; Tuesday: St. Jean-Baptiste; Wednesday: St. Etienne; Thursday: a child holding a chalice and a host; Friday: a child with the symbols of the crucifixion; and on Saturday: the Virgin Mary. The astronomical clock rings every day at noon, 2 pm, 3 pm, and 4 pm. The beginning is slow, but patient people will be rewarded when God gives three blessings from his place on the clock in the clouds.Update June 2017: Sadly, the clock, although visible, is currently not working. There’s no word on when it will be fixed. Take the metro line D to Vieux Lyon/Cathédrale St-Jean. The clock is on the left hand side of the cathedral. Lyon's miniature version of the Eiffel Tower was built as a statement in support of French secularism.